It’s all too easy for Americans to mock, malign, lambast, lampoon, and otherwise ridicule the Liberals and Progressives as the protest, riot, and either scurry around in attempt to circumvent democracy or just cry, twitch, and shake in their “safe spaces.” Truly, it just too easy to do so. They do, after all. deserve such treatment by Americans. Sadly however, it is too easy and, as such, it’s but a passing pleasure that soon grows stale. Especially interesting and of note are those losers who have embraced the #NotMyPresident twitter hashtagery and its real world pseudo-equivalent. They at least, if you look at it in a certain way, have something akin to a point. Mr. Trump isn’t and hopefully to my mind will never be their President. The Gods willing, he is and will remain our President. And why not? For eight years – and it’s not quite over yet – the American people have been saddled with Obama, who very much wasn’t and isn’t our President. From the miscegenation of his first campaign to be the Democrats’ nominee for POTUS to this very day, the vast bulk of his rhetoric has proven this sad fact. Almost everything Obama has ever said was actively against us or, at best, dismissive of us, our beliefs, and our long-held and cherished culture. 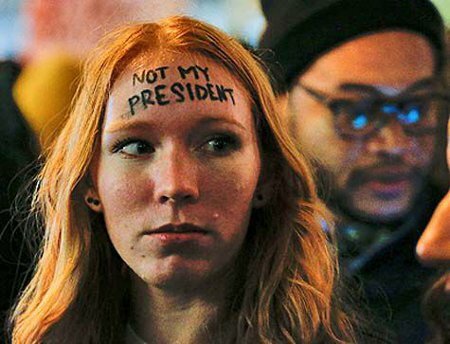 So no, Obama wasn’t our President and Trump won’t be their President. In this, if in almost nothing else, these puling Liberals have a point – a point a counsel each and every American to hammer home into their minds. This entry was posted on Sunday, November 20th, 2016 at 12:34 pm and is filed under 2016 Election, Politics. You can leave a response, or trackback from your own site.